In his annual address to both houses of parliament, President Vladimir Putin announced a large-scale program for the liberalization of the Russian economy. In particular, he proposed an amnesty for the repatriation of offshore capital and tax breaks for small businesses. However, Russian experts point out that some of the initiatives are somewhat overdue. Laying out his plans for the economy in his state-of-the-nation address, Russian President Vladimir Putin has proposed a large-scale amnesty for capital returning from offshore accounts and tax breaks for small businesses. In his annual speech to both houses of the Russian parliament on Dec. 4, Putin announced a large-scale program for the liberalization of the Russian economy and set the target of bringing annual investment into the Russian economy to the amount of 25 percent of the country’s GDP by 2018. “The economic section of the president’s address covers numerous good things: deoffshorization, various forms of assistance for small business, transparent inspections, tax breaks,” says Andrei Yepifantsev, head of research at analytical bureau Alte et Certe. When Russia has been cut off from global capital markets and the country needs to seek investment, he continues, Putin is sending a positive signal both to capital that has fled the country and to business. One of the ways of attracting more investment into the economy, as proposed by Putin, is a large-scale program for returning capital from offshore zones. 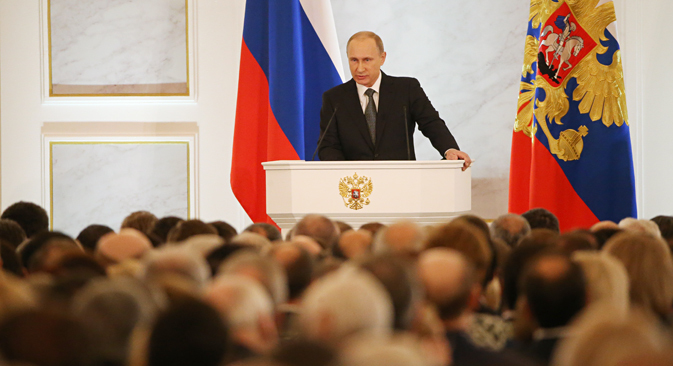 To that end, the president suggested declaring a complete amnesty on capital repatriated to Russia. “If a person legalizes his holdings and property in Russia, he will receive firm legal guarantees that he will not be summoned to various agencies, that he will not be asked about the sources of his capital and the methods of its acquisition,” Putin declared. Furthermore, he explained, capital returning to Russia under amnesty will not be subjected to additional taxes. “As was expected, the president chose a path towards a liberalization of the economy, as this is the only evident alternative to a complete isolation,” says Ilya Balakirev, chief analyst with UFS IC. Balakirev points out that the idea of a complete amnesty on returning capital had been discussed more than once and that there had even been an attempt to carry it out. However, there turned out to be little demand for the initiative at the time. “What is being proposed now is an even more radical option, whereby capital is freed from any persecution and taxation,” says Balakirev. To what degree it will work, he adds, will depend on additional incentives and, possibly, on the example that businessmen close to the Kremlin will or will not set. However, according to Ilya Balakirev, in a global sense the initiative will not be enough to prompt deoffshorization, since there is more at stake than simply avoiding tax and difficult questions about the origins of capital. “Companies use entities registered in foreign jurisdictions and under foreign laws not only for tax-evasion purposes but also, for example, in order to ensure a better protection of its interests in international courts, or to achieve a better structure for deals that do not have a clear legal basis in Russia,” says Balakirev. For these deals to come to Russia, he continues, there needs to be a lengthy and complex evolution of the law and the judicial system, which is highly unlikely to be achieved within a short period of time. As an additional incentive for developing business in Russia, Vladimir Putin named preferential terms for new businesses, as well as guarantees that the existing tax system will remain unchanged. In particular, the president said, tax conditions in Russia will be fixed for a period of four years, with no new taxes introduced during this time. Furthermore, two-year tax breaks will be introduced for greenfield industrial projects. Balakirev says that such a step would be in the interests of developing business in Russia. “If a reduction in administrative barriers turns out to be more than a mere declaration, it could become a good aid for developing small businesses,” he explains. Anton Soroko, meanwhile, points out that these initiatives are a long-discussed step towards making the future more predictable. “The thing is that businesses in Russia, just like ordinary consumers, do not want to invest in long-term investment projects because they cannot forecast what will be happening in the economy in the future,” he says. According to Vladimir Putin, these decisions should generate a 50-percent growth in the export of goods other than raw materials. To that end, the head of state has proposed setting up a coordination center in the Russian government to oversee large investment projects and develop domestic production and technology. However, according to Andrei Yepifantsev from Alte et Certe, the president’s address is somewhat outdated in its spirit: “Given the challenges and problems that Russia is now facing, this address was expected to be different: more substantial and more profound, signifying a real transformation,” he says.